On the weekend, Lisa likes to ride her bicycle near the Han River. There is a bicycle path there, and she feels relatively safe. Right beside the bicycle path, there is also a separate path for pedestrians (similar to the above photo). Lisa feels there is no better place to ride a bicycle in Seoul. One Saturday afternoon, Lisa is riding her bicycle at 20 km/h on a bicycle path. Everything is fine until an old lady (who was walking on the pedestrian path) suddenly darts into the bicycle path! Lisa has no time to avoid the lady and hits her head-on. As a result of this collision, the old lady suffers a serious brain injury. Even after multiple surgeries, she is unable to talk freely + she is left virtually paralyzed on her left side. The old lady and her family sue Lisa for an amount of KRW 330,000,000 (USD 293,000). How is the Korean court likely to decide? The Seoul Central District Court ruled for the plaintiffs, but found the defendant only 40% responsible. This means the defendant (i.e., Lisa) will have to pay KRW 100,000,000 (USD 88,800). (1) Every motor vehicle driver shall correctly operate the steering system, brakes and other devices of his/her motor vehicle and shall not drive his/her motor vehicle at a speed and in a manner that endangers and impedes other persons according to the traffic conditions of the relevant road and the structure and performance of his/her motor vehicle. (2) Every motor vehicle driver shall endeavor to reduce fuel consumption and carbon emissions by driving in an environmentally-friendly and economical way. 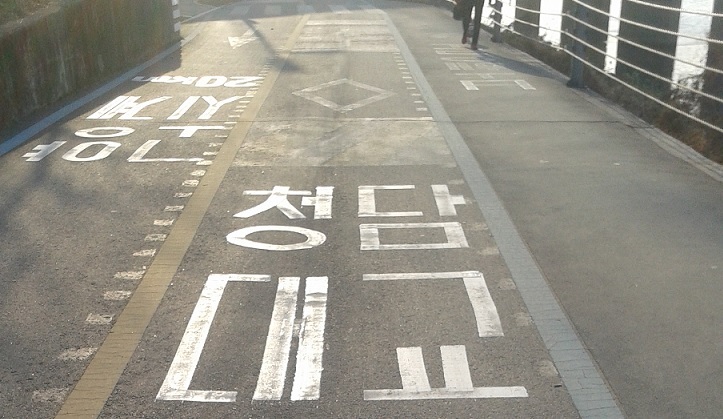 In Korea, people also like to refer to Article 48(1) as “전방주시의무.” It refers to the duty of the driver/rider to “always look ahead and drive/ride defensively.” FYI, bicycles are considered as “motor vehicles” when being ridden. DID YOU KNOW? Most bicycle insurance policies (here in Korea) only cover personal injuries to the cyclist him/herself. Very few cover injuries (to others) or bicycle theft. I generally feel this decision was unfair to the defendant. After all, the defendant was riding at around 20 km/h (the max speed allowed along a river/stream), and the accident occurred on a bicycle path where pedestrians are not normally allowed. At any rate, the crucial factor in these types of cases is whether you can successfully convey to the court/judge there was absolutely nothing you could have done to avoid the collision. This is why, I think, installing a “black box” on your bicycle is so important nowadays. With no hard/conclusive evidence, Korean courts are inclined to find the driver/rider partially at fault (in Pedestrian v. Driver/Rider cases). 1) When there is a pedestrian path right next to a bicycle path, you must ride slower than normal/allowed. 2) Always assume any pedestrian ahead can/will suddenly drift in and out of a bicycle path. To learn more about bicycle law in Korea, click here.